Dias said GM's Oshawa complex, where production of four models it produces is set to be shipped elsewhere, is in dire need of new product. Ask Unifor President Jerry Dias what’s at stake in upcoming labour negotiations with the Detroit 3 automakers, and he’ll say it’s nothing less than the future of the Canadian auto industry. Dias, who heads the union representing Canadian auto workers, said three of Canada’s eight parts and assembly plants represented by Unifor -- General Motors’ Oshawa, Ontario, assembly plant; Ford Motor Co.’s Windsor, Ontario, engine assembly factories; and Fiat Chrysler’s Brampton, Ontario, assembly plant -- are in danger of closing if they don’t secure future product. The plants, which employ about 31 percent of the 23,500 Detroit 3 workers that Unifor represents, will be the focus of the union’s negotiations with the automakers. Unifor’s contracts with the Detroit 3 expire on Sept. 19. The negotiations come as the Detroit 3 have shifted production and investments to Mexico and away from Ontario and the U.S. Midwest. The shift to Mexico has hit Canada particularly hard, as indicated by a 2015 report by the Automotive Policy Research Centre that found the country lost 53,000 auto jobs since 2001. Production has shifted away from Canada and the Midwestern U.S. -- the continent’s traditional auto manufacturing hub -- and toward Mexico over the last several years. Automakers see advantages in Mexico, including lower labour costs and access to global markets via numerous free trade agreements, that have made it a more desirable location for new investment. Dias said the union’s top priority in negotiations is bucking that trend. He said GM’s Oshawa facility, where production of four models it produces is set to be shipped elsewhere, is in dire need of new product. Dias said Unifor is presenting GM with a choice -- either invest in Oshawa or risk a strike. “There’s not going to be a settlement with GM if they close the plant,” he said. GM employs about 2,600 workers at the plant. The Oshawa plant produces the Buick Regal, Cadillac XTS, Chevrolet Equinox and Chevrolet Impala. Production of all four models is set to move to other plants or be halted, leaving Oshawa with no long-term commitments and putting it in danger of closing if Unifor does not secure new products, Dias said. 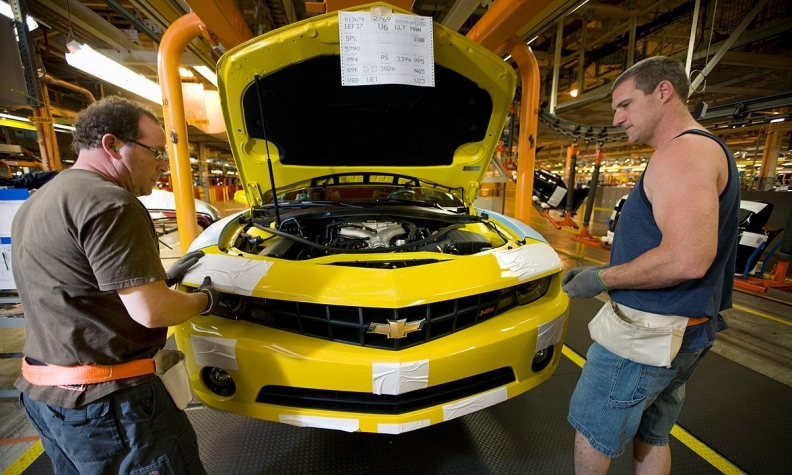 GM said earlier this month that it would hire 700 engineering and technical jobs in Oshawa. GM Canada President Stephen Carlisle said on Tuesday that Unifor and automakers must work together to address labour concerns and keep Canadian plants open. Dias said he is “not as concerned” about FCA’s Brampton factory as he is about Oshawa or Ford’s Windsor engine plants. But Brampton’s future looks a bit less certain after FCA CEO Sergio Marchionne said in May that the automaker could produce the Chrysler 300 on the same line as the Pacifica minivan, potentially moving 300 production away from Brampton to FCA’s Windsor plant. FCA employs about 3,300 hourly workers in Brampton, according to the automaker’s website. Kristin Dziczek, director of the Industry, Labor and Economics Group at the Center for Automotive Research, said it “is really going to be hard” for Canada to keep its automotive jobs in the long run. She compared the state of the Canadian auto industry to that of Australia, which will cease auto production after Toyota shutters its Australian plant in 2017. In addition to higher labour costs than those of Mexico or the Southern U.S., Dziczek said two of Unifor’s biggest selling points -- advantages in health care and production -- have become weaker. Dziczek said a restructured U.S. health care plan with the UAW, in addition to a younger U.S. workforce, has reduced the Canadian health care advantage. “You need to have new investment and new product in order to continue production for a longer term, and we haven’t seen a lot of investment in Canada,” she said. This year’s negotiations follow those in 2012 by the Canadian Auto Workers, which in 2013 merged with the Communications, Energy and Paperworkers Union of Canada to form Unifor. The CAW’s 2012 deals with the Detroit 3 contained no base wage increases, though they did include three $2,000 lump-sum cost-of-living payments. Workers at Canadian Detroit 3 plants have not received a raise in a decade. Dziczek said that although it’s possible Canadian auto workers could see a wage increase like their U.S. counterparts did in 2015, she cautioned that a raise could make the Canadian market even less attractive in the long run. Dias said the union’s push for investments could be made easier by the Canadian government, which last fall elected a Liberal government led by Prime Minister Justin Trudeau. Dias said Trudeau’s government is friendlier to the auto industry and labour than the previous Conservative regime, which he said viewed auto incentives as “corporate welfare” and made it difficult to keep and attract auto companies. Dias said Trudeau and Ontario Premier Kathleen Wynne have been in communication with Unifor about ways it can bolster auto investment in Canada, saying he’s had more discussions with Trudeau in his first year in office than he did under his predecessor, Stephen Harper. Wynne last week announced an $85 million investment in FCA’s Windsor plant. Dias said last year’s negotiations with the Detroit 3 by Unifor’s American counterparts at the UAW provide hope. The UAW secured about $16 billion in investment at U.S. plants and was able to mostly kill the controversial two-tier pay system, though most car production is set to shift to Mexico as high-margin truck and SUV production remains in the U.S. But last year’s American labour talks were fraught with setbacks after an initial deal with FCA was struck down and a contract with Ford was narrowly ratified. UAW leaders blamed the close votes in part on what it deemed to be misleading posts on social media, a problem Dias said Unifor is looking to avoid. “We have got to be active on social media,” he said.